FILE - This combination of photos shows U.S. President Donald Trump on the South Lawn of the White House, Jan. 5, 2018, and former FBI Director Robert Mueller, special counsel on the Russian investigation, at the U.S. Capitol, June 21, 2017. The Russia probe led by special counsel Robert Mueller appears to be entering a new phase in the wake of last week's guilty plea by Michael Cohen, who had long served as President Donald Trump's personal attorney. Now, legal analysts are debating whether the Russia investigation is moving toward a conclusion, and if so, what the stakes could be for the president and for the country. Last week in New York, Cohen pleaded guilty to lying to Congress to mislead lawmakers about Trump's interest in a building project in Russia while he was running for president. 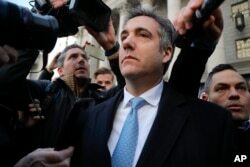 Cohen, who once famously bragged he would "take a bullet" for Trump, told investigators in August that then-candidate Trump had ordered him to illegally arrange payments to buy the silence of two women who claimed affairs with Trump prior to the 2016 election. FILE - Michael Cohen walks out of federal court in New York, Nov. 29, 2018. A short time after Cohen's plea last week, Trump told reporters at the White House that Cohen was lying to get a better deal from the special counsel. "No. Not at all. Not at all. I am not worried at all about him," Trump told reporters shortly before he left for the G-20 summit in Argentina. The president was back on the attack on both Cohen and Mueller on Monday. In a series of tweets, Trump said Cohen was a "proven liar" and said he should serve a "full and complete" jail sentence. Trump also lashed out at Mueller and his "out of control band of Angry Democrats." Trump tweeted they "don't want the truth, they only want lies." "This is one more example of one of the president's closest allies lying about their ties to Russia and Russians," he said. 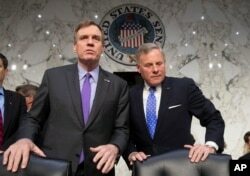 FILE - Senate Intelligence Committee Vice Chairman Mark Warner, D-Va., left, and Sen. Richard Burr, R-N.C., the panel chairman, are pictured prior to a hearing on Capitol Hill in Washington, May 9, 2018. "Our mandate is at the end of this is to get as close to the clear truth as we possibly can. And we can't do it on conjecture. We have to do it on facts," Burr told a recent gathering in Texas. "I would expect that we would see some sort of conclusion of this within the next few months," said Ohio State legal expert Ric Simmons via Skype. "Again, he [Mueller] does not have a timeline that he is required to meet by law and he does not have to tell us where he is, so we can't know for sure." "It does, I think, add more legitimacy to the investigation," said University of Connecticut law professor Doug Spencer. "And that there is actually a lot of smoke going on in this particular realm that deserves investigation. I think it undercuts the claims that this is a hoax, or that this is a witch hunt." Spencer also said he thinks public support for the investigation "has begun to increase again." "He has done a lot of work with other witnesses that have flipped, and he has had months to work with them too. So I would expect that we would see some sort of conclusion of this within the next few months," Simmons said. "Because he was able to get some of these responses in writing, that does suggest that he is reaching the final stages of the people that he wants to interview and that he has reached the final stages of fact collection."